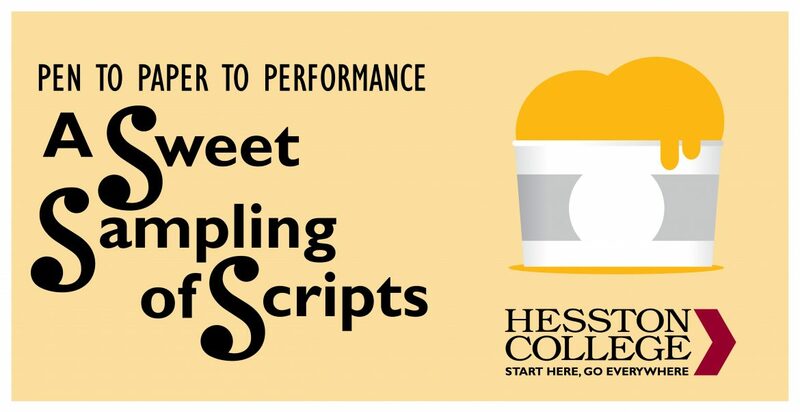 For the third year, Hesston College’s Pen to Paper to Performance playwriting festival will showcase the work of seven local playwrights at 7 p.m., April 26 and 27, in the Keim Center Black Box Theater on the Hesston College campus. “An ensemble of 14 actors are working on these six very different shows,” said Rachel Jantzi, Hesston College Theatre professor and director. “All are cast at least twice, with some appearing in three different plays. That can be challenging, but the actors are so strong, it makes the work really enjoyable. In addition to student actors, two Hesston College professors are also part of the cast – Michele Hershberger, Bible and ministry professor, and Ken Rodgers, music professor. Each play runs about 10 minutes in length, and the event is rated PG for mild language. Tickets are $8 for adults, and $4 for students. Tickets will be sold at the door only starting at 6:15 p.m. each night. Seating is limited, so early arrival is encouraged. Each playwright will receive a portion of the box office earnings. Each night’s performance will include a 30-minute pre-show by the student-led On A Lark improv comedy troupe beginning at 6:30 p.m.
During intermission, ice cream will be served by The Salted Creamery, whose owner and creator is Hesston College communications professor Kendra Burkey.